Today’s recipe, Beef Tongue in Almond Sauce, is a delicious and elegant dish that’s perfect for a nice dinner with friends. The beef tongue is cooked until tender, then sliced and added to the almond sauce. Once you serve it, everyone will want to dip a piece of bread into the rich sauce! 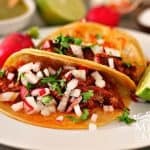 If you enjoy beef tongue, you definitely need to explore beyond the classic boiled beef tacos; this cut of meat is a delicacy that deserves to be prepared in endless ways! I promise you, any way you decide to cook this cut of meat will be a hit with your family. Like a friend of mine used to say, the best parts of the cow are the ends: the beef tongue and the oxtail! While doing some research trying to find out more about this recipe, I only found out that it is popular in the State of Zacatecas, a north-central state that is known for its rich mineral deposits and its Colonial architecture. Although I have a couple of old cookbooks from that state, none of them mention this recipe. I’ll keep searching for more information and update this post later on. Enjoy this easy recipe, the beef tongue when cooked right is a delicacy, and the almond sauce is sublime! Remember to look for the RUMBA® meats brand, their products come in a carefully vacuum sealed package that allows you to store in your fridge for several days without freezing them. Always check the indications and date on the packing in order to use or freeze the product. Go to your local Market or Giant Store to find their products. In the meantime, let’s dig into the recipe! Place the beef tongue in your instant pot along with the onion, garlic, and herbs. Cover with water and cook for 30 minutes. If using a regular pot, cook over medium-high heat until it comes to a boil. Reduce the heat and gently simmer. Cook until it is tender, about 2 hours. Make sure that you cook it until it is tender, but still firm enough to cut into slices. Once the beef tongue is cooked, wait until it has cooled and then remove the outer skin. Cut into 1/3-inch slices and set aside. While the beef tongue is cooking, heat 2 tablespoons of oil in a large skillet over medium heat. Fry the bread slices until they are a light golden brown, turning once. Set aside. In the same skillet, fry the almonds, onion, and garlic clove for about 8 minutes. Add the tomatoes and keep cooking until the tomatoes have released their juices. Place this tomato-almond mixture into your blender and add the clove, peppercorns, cinnamon, and sherry. Process until you have a smooth sauce. Using the same skillet as before, heat the rest of the oil at medium heat and then pour the tomato–almond sauce in. Add 1 cup of the beef tongue’s broth and gently simmer for about 15 minutes. Season with salt. Add the beef tongue slices and keep cooking for 8 more minutes, until the sauce has reduced. Serve with white rice and garnish with the olives, pickled jalapeños, and chopped parsley. If you are looking for more recipes using Beef Tongue, check this Beef Tongue in Green Salsa.